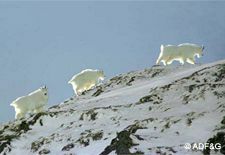 Goat hunting no matter if you are hunting Kodiak or elsewhere is one of the most physical and dangerous hunts there is. Hunters have to be prepared to endure high winds, heavy packs, heavy rain, snow, and rugged terrain. Rest assured, a clean hunting camp is a happy camp! Bring along a marine or aviation radio, EPIRB or satellite phone to contact help in case of an emergency (remember that electronic devices cannot be used to assist you during your hunt). Small 2-3 man dome tents withstand strong winds better than large tents (bring some extra tarps just in case). Hunt with a partner. Leave a note in camp saying where you are hunting and when you will return if you are hunting alone. A herd moves up to escape cover. Bring along a first aid kit and signaling devices such as flares or orange smoke. On Kodiak a tarp laid out on the ground signals that a hunter is ready to be picked up by an air taxi. When low clouds and severe weather hits keep close to your camp (bring a book). 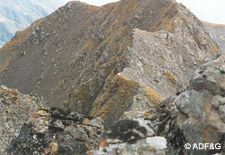 Be bear aware on the mountain as well as in the lowlands (MAKE NOISE IN BRUSHY AREAS). Wait for goats to move off of difficult terrain before pulling the trigger. Be patient and wait for goats to move off of difficult terrain before pulling the trigger (that way the rope stays in the pack). Keep your camp and yourself dry and in good working order. Allow for bad weather days--bring extra food. The Kodiak archipelago is home for about 3,500 of the largest bears in the world. 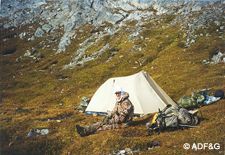 Goat hunters may encounter bears when camped at the top of a mountain, and they are even more likely to have interactions with bears if they hike down to sea level to be picked up for their flight back to Kodiak. Goat season opens in late August when many bears are concentrated at the heads of bays or on salmon streams, catching and feeding on salmon. You should take this into consideration when you are planning where you want the floatplane pilot to drop you off before your hunt and pick up after your hunt. You do not want to hike through or camp in the midst of a high concentration of bears, especially if you are packing goat meat. With some advanced planning, you can avoid the likelihood of a bear confrontation and ensure a successful, enjoyable hunt. Plan Ahead. This is the single most important thing you can do to avoid bear encounters. Research your hunting area, and avoid being picked up in areas of high bear concentration, such as near salmon streams. Avoid hiking or camping in these high-bear-concentration areas, especially if you have goat meat. Hunt with a partner. Stay in close communication while hunting and next to each other while processing the goat you’ve harvested. Leave a note in camp saying where you’re hunting and when you plan to return. Be meticulous and keep a clean camp. Store food and unwashed cooking utensils in clean, air-tight containers to minimize odors. Avoid cooking or eating in your tent. Put food out of a bear’s reach, and never store any food in your sleeping tent. Use a portable electric fence around your campsite if possible. Pack all goat meat out in one load. If this isn’t possible, put the remaining meat in game bags and hang in a tree or stash in an open area away from the kill site. Remember that the horns and hide cannot be taken out until all meat is back at camp. Hang goat meat at least ten-feet high in a tree and away from your campsite. Have reliable communication gear such as a satellite phone, so you can call for a pickup as soon as you are ready. Leave the area if possible by the closest route without disturbing the bear. If the bear approaches you, make noise. Make the bear aware of your presence, by shouting, waving your arms, sounding an air horn or firing into the ground. Use pepper spray if the bear approaches closely. If the bear claims your goat meat, do not try to drive it away. The meat is probably already soiled, and Alaska State Regulations prohibit killing a bear to retrieve hunter-killed game.